The Cincinnati Bengals offense is going through some forced growing pains. Without A.J. Green and Giovani Beranrd, the team is without two players accountable for over 40 percent of its total offense, and roughly 60 percent of the scoring offense. Offensive coordinator Ken Zampese now has to rely on added production from rookies like Tyler Boyd and Cody Core, as well as established yet seldom-used veterans like James Wright and Rex Burkhead. It’s not a flashy situation, as none of those four players have shown an ability to change the dynamic of a game like A.J. or Gio can. That said, there’s a way to win with these guys, but it can’t be done by continuing to play as if you still have your dynamic playmakers. Tyler Eifert will draw more prioritized coverage now that offenses don’t have to worry about doubling a premier receiver on the boundary. And while the offense may have stunk up the joint on Sunday, there were plays that showed a glimmer of (relative) hope for this team in the coming weeks, and enough individuals stepped up to make me believe that winning a game this season without A.J. Green is possible. Tyler Boyd seems to have stepped up the most. The second-round pick has been used sparingly throughout the year, though as the season has progressed he’s become a more focal point in the offense. The out route he uses in the above GIF is a pattern he had success with multiple times in this game, on both sides of the field. Notice that the defensive back is positioned to take away inside positioning, so Boyd helps himself by running slightly inward before breaking out, giving him more room to work with. This also gives Andy Dalton an easier throw, as he has more field to cover without worrying of leading Boyd out of bounds. Subtle differences like this are what make Boyd such a good route runner, even as a rookie. That technique is largely what made him a second-round pick, as his physical skill set isn’t going to blow anyone away. But with excellent technique and routes, he’s likely to have a long and prosperous NFL career. While it’s nice to have rookies step up when needed, times like these also call for a step up from your more dependable veteran players: Brandon LaFell and Tyler Eifert. Without Green, it’s going to be more and more difficult to try and feature Eifert as a focal point in the offense. He’s still going to be a reliable target in the red zone, but beyond that, the team may have to take what the defense will give them. The above seam route is an example of the defense specifically trying to take away Eifert, but 85 being just too much. He’s jammed at the line of scrimmage to help the linebacker covering him buy some time, but even then Eifert is able to get up to speed quickly and sit behind the defender for a large gain. You’re likely to see a lot of these types of plays from Eifert, as he’s going to have to work to get open more than he ever has in the NFL. Brandon LaFell, on the other hand, can keep helping Dalton by connecting on good timing patterns and being a reliable number two receiver. LaFell has proven to be a great complementary receiver on the opposite of Green, but he’s not a guy that can fill the speedy, spring-loaded, flawless-route-running shoes of A.J. for a few weeks. He doesn’t have the natural ball skills, the deep threat speed, or “it” factor that Green does. The ex-Patriot is simply just a good prototypical depth receiver. He runs good routes, he gets an adequate amount of space, and can move the chains for you. There will be no head turning performances, but he can get you about 70 yards receiving week in and week out, which adds up over the course of a season. The above play exemplifies the type of pro that he is: Nothing flashy, just a nice post route that Dalton times very well and shows the two players in sync. The good news is that Green seems likely to come back at some point in the final five games. Bernard, unfortunately, won’t be, which is why I think the most crucial player to the Bengals in the remaining weeks of the season will be Rex Burkhead. 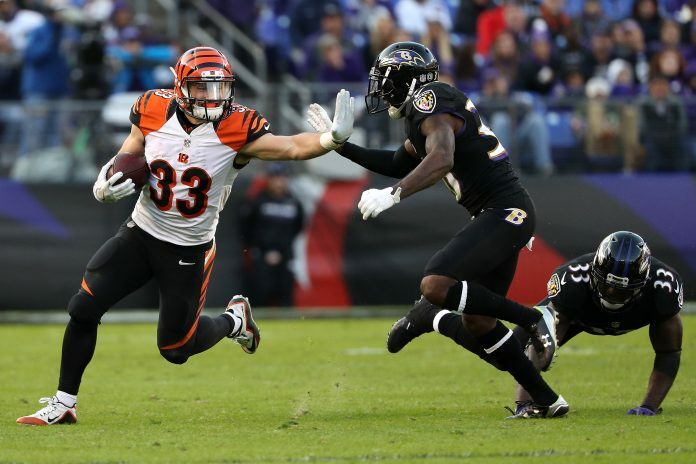 Thankfully, Burkhead is a much more capable back than most Bengals fans may realize, and I hope he’s featured more moving forward than he was against Baltimore. Rex is a good pass protector, filling in admirably for Giovani Bernard in one of the areas that I expected the Bengals to suffer the most in his absence. Dalton was still sacked multiple times, but from the tape I watched, none of it was at the fault of Rex. The guy is also a great receiving back, capable of being moved into the slot and running more patterns than backs are generally asked to. But most important, he’s a really underrated runner. He reads blocks excellently, makes great slash cuts to lose defenders, yet continues to move north and south when he can. He’s got enough speed to get to the corner when asked to do so. Burkhead wasn’t featured as a runner until the fourth quarter this past week, which I think is absolutely criminal. Jeremy Hill hasn’t been able to do much this season, and the offense continues to look stagnant, so if I were Ken Zampese, I’d feature an added dose of Burkhead this Sunday against the Eagles. At 3-7-1, the team realistically isn’t playing for the playoffs anymore. But the team can build some positive momentum for 2017 by showing fans that they aren’t going to back down, even with all the adversity and poor play they’ve encountered thus far. It won’t be easy, and securing wins isn’t likely to be pretty, but there’s hope in this unit to put up enough points to get some wins. The tools are there, and I believe the effort still is too—they just need to be put in the best position to win the game. That’s where the problem has been all season. Maybe they’ll finally learn from their shortcomings. Braden Whited is a contributor to Fulcher 2 Stay and Cincy Jungle. You can follow him on Twitter at @BradenWhited.